Protecting and ensuring civil rights is important to me—which is why I believe Senator Jeff Sessions with his record of being on the wrong side of America’s ongoing civil-rights fight is the wrong person to lead the department of justice. I wasn’t happy to learn Senator Dianne Feinstein, one of my California Democratic senators, was not committing to voting against him. So, I wrote a script to use for a phone call and an email to her office. If civil rights are important to you too, please call your US senators and urge them to vote no on Jeff Sessions for attorney general. Feel free to use my script or modify it to explain why you are against Sessions. 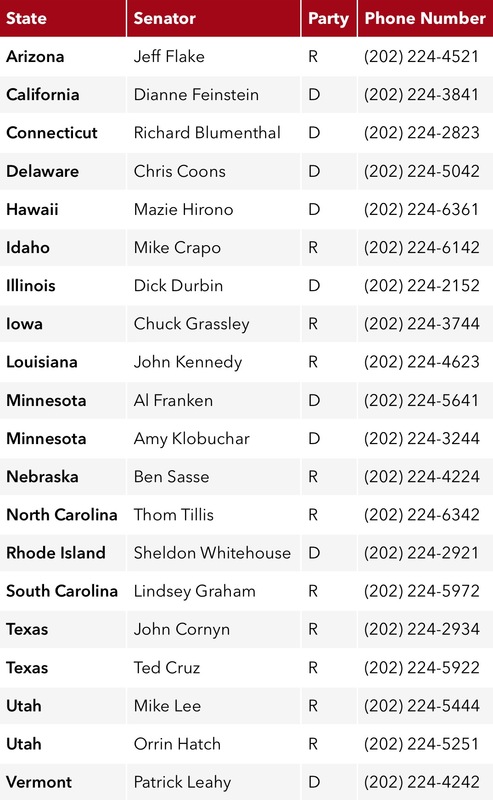 You can find contact information for your senators on this senate page. Californians: here’s Senator Feinstein’s contact information. Hello, my name is Joe Hribar, and I am one of Senator Feinstein’s constituents from Los Angeles. I am calling to urge Senator Feinstein to vote against Senator Jeff Sessions for attorney general. In 1986, he was deemed too racist by the senate for a federal judgeship. Since then, he has remained on the wrong side of America’s ongoing civil-rights fight with his opposition to the Voting Rights Act, the Violence Against Women Act, and the Hate Crimes Prevention Act as well as his support of suppressive voter-ID laws and a religious test to ban Muslim immigrants. Senator Sessions is the wrong person to be entrusted with protecting and ensuring civil rights, and I urge Senator Feinstein to vote no on him for attorney general. Hello, my name is Joe Hribar, and I am one of Senator Feinstein’s constituents from Los Angeles. I am writing to urge Senator Feinstein to vote against Senator Jeff Sessions for attorney general of the United States. Senator Sessions has a clear record of racist and anti-equality positions and is therefore the wrong person to lead the department of justice. In 1985, he wrongly prosecuted three civil-rights activists (they were acquitted), including an aide of Martin Luther King, for voter fraud. He is a proponent of the widely debunked claim of voter fraud and supports suppressive voter-ID laws. Additionally, he has supported a religious test to ban Muslim immigrants, he voted against the Violence Against Women Act and the extension of the Hate Crimes Prevention Act, and he has consistently received a “F” grade from the NAACP. I will be watching the vote closely. Should Senator Feinstein decide to vote in favor of Senator Sessions, I will be an active and vocal supporter of her primary challenger next year.